"You have to be careful, not to listen to me. But I can't live like this. I have to go out and each time it's like this." While many of my favorite horror films that I grew up with are now mostly just products of my own nostalgia, a few still manage to thrill, terrify and scare me the same way they did when I first experienced them as a youth. 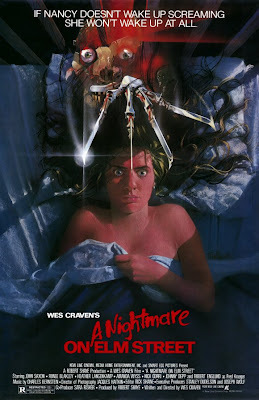 A key film from my teenage years that continues to haunt me is Wes Craven’s enduring A Nightmare on Elm Street, an ingenious work that hasn’t lost its ability to shock twenty-five years after it first terrified audiences in 1984. Often undervalued by film fans and critics, Wes Craven is one of the few American directors who managed to delivery seminal works in not just two, but three different decades. Regardless of some career inconsistencies, his Last House on the Left, The Hills Have Eyes, A Nightmare on Elm Street and Scream continue to resonate in popular culture to this day. His greatest works continue to be some of the most copied films in modern American cinema as well as some of the stylish. He was never greater though than he was in 1984 when he warned audiences around the world to not go to sleep. The genesis of A Nightmare on Elm Street is the stuff of film legend now so there isn’t much need of going into much detail on it here. After getting the idea of from a 1981 Los Angeles Times story about a youth who was convinced he would be killed if he fell asleep, Craven began shopping around what would become his most legendary film to every studio that looked like they might have a partially open door for him. After being turned down by everyone he pitched to for nearly three years, Craven was finally given the green light by the visionary Bob Shay at the young New Line Cinema, a company hungry for a defining hit. Indeed it was the defining hit that both New Line and Wes Craven needed. It was one of those films that seemed to instantly catch fire with film fans, and its critical (albeit mixed) and popular success was more than justified. While most of the mid eighties horror flicks have long since faded from memory, A Nightmare on Elm Street and Freddy Krueger continue to loudly reverberate. Like Halloween and Friday the 13th, the power of the original A Nightmare on Elm Street has been partially diminished by its highly inferior sequels. While most of them are inconsequential to say the least, I will always stand by Part 3’s The Dream Warriors as being one of the most flat out entertaining horror films of the eighties (not to mention the fact that it introduced the world to the wonderful Patricia Arquette), and I quite admire Craven’s own New Nightmare as well. The diminished returns of the majority of the sequels (and the dreaded remake on the horizon) shouldn’t take away from the power of Craven’s original film. A Nightmare on Elm Street remains a masterful piece of filmmaking from a clearly frustrated artist looking to unleash a very clear, personal and quite startling vision. Serge Gainsbourg was professionally riding high at the dawn of 1965. Announcing quite boldly that he was ready to throw himself into “rock…real rock”, the already popular French singer, songwriter and actor set in motion a new direction that would reach its stunning peak, just over five years later, with the release of the mind-blowing Histoire de Melody Nelson album. Gainsbourg had a ways to go though and the two-minute 45 that began the explosion was the delightfully catchy “Poupee De Cire”, a Eurovision winner sang by the absolutely scrumptious and always captivating France Gall. While the first France Gall collaboration in 1965 was a small triumph for Gainsbourg, he found himself growing more and more frustrated as the year progressed. He had never been more popular with the public, but his personal life was scattering as his marriage to then wife Beatrice was disintegrating. By the end of the year, France’s most popular songwriter was an exhausted artist who needed a break from marriage and, briefly, the public eye. He found that respite at the apartment of a friend named Pierre Koralnik, a young Swiss filmmaker who offered his pad to Gainsbourg so the struggling artist could effectively get refueled. Author Sylvie Simmon’s notes in her entertaining Serge Gainsbourg: A Fistful of Gitanes that tension arose between the two young roommates fairly quickly, when Koralnik criticized Gainsbourg for offering up too much mediocre material to singers not worth the vinyl they were being pressed on. Gainsbourg had reasons though for his prolific songwriting period between 1966 and 1967, which was namely to open “up the record market” to release “whatever he liked.” The gamble paid off and, by 1967, Serge was ready to begin one of the most remarkable periods for any popular musician ever, a five year span that would see him creating some of the most astonishing and influential albums of the era (first with Brigitte Bardot and then with Jane Birkin). Before Gainsbourg was entranced and then shattered by Bardot he wrote the music for, and acted in, the spectacular television film Anna, a visionary work Koralnik had crafted with the help of writer Jean-Loup Dabadie. A propulsive pop-art masterpiece featuring eye popping color and one of the best soundtracks of the sixties, Anna (1967) is a miracle of a film, and the fact that it was originally made for television and not the big screen makes it one of the most head scratching curiosities of the sixties. Originally planned as a vehicle for red-hot British singing sensation Marianne Faithfull, Anna was granted its perfect heroine when Jean-Luc Godard’s muse and then wife Anna Karina came on board. Joining the luminous and haunting Karina was the wonderful and handsome Jean-Claude Brialy starring as Serge, a hip young ad exec who becomes positively entanced by a photograph of a mysterious young woman who he becomes obsessed with tracking down. With New Wave icons Karina and Brialy aboard, Anna stands as one of the most bizarre chapters in a delirious period of filmmaking that would see the original directors of the famed French movement scattering in dramatic, and often antagonist, ways. Koralnik was not part of the New Wave, but there is no denying its influence on Anna, specifically Godard’s stunning 1961 colorful masterpiece A Woman is a Woman, a musical satire which Karina had also graced with her delightful presence. Anna is a wonderfully hard production to pin down. Savage satire mixed with a sweet love story and frenzied comedy crossed with surrealistic fantasy, Anna in its own way is one of the most confrontational films of the period. More than anything else though it is a brilliant musical, filled with some of the most exciting songs of Serge Gainsbourg’s career. It is also a tribute to the great beauty of Anna Karina and Jean-Claude Brialy, as well as being both a homage and critique to our fascination with such perfection in pop culture. While either Karina and Brialy feature in almost every shot in Anna, a couple of other welcome faces pop up as well, including Marianne Faithfull who was able to make time in her incredibly frantic schedule to film one of Anna's most memorable scenes. French singing sensation Eddy Mitchell also appears in a crowded and dizzying party sequence. Perhaps the real star of Anna, outside of Gainsbourg’s score and Karina’s face, is the dazzling photography of cinematographer Willy Kurant. The talented Kurant, who has worked with everyone from Jean-Luc Godard to Pink Floyd, is at the top of his game here and Anna is absolutely astounding to look at. Kurant’s photography is so vivid, and the costume designs of Lison Bonfils and Anne Frantz are so spectacular to look at, that they almost overwhelm the fact that Koralnik’s film is at its heart a rather biting satiric look at the often shallow and materialistic place the world was becoming in 1967. Who’s kidding who though, as Anna is also a firm celebration of that world, a contradiction that makes it all the more entrancing all these years later. With its extraordinarily bizarre dance sequences, catchy and altogether tremendous Gainsbourg score and a haunting final sequence that foreshadows Bob Fosse’s ferociously autobiographical All That Jazz by well over a decade, Anna is impossible to take your eyes off of. It is, simply put, one of the most perfectly realized and rendered works of the sixties. The imaginative Koralnik has mostly remained in television throughout his career, but he has a couple of features to his credit including the masterful and intense Cannabis (1970), one of the most memorable films the unstoppable team of Gainsbourg and Birkin made together. His greatest work, Anna, would be a hit on French television (and in some French theaters) but one has to wonder what its impact would have been on the worldwide big-screen. Serge Gainsbourg barely took a moment to ponder on its possible impact to the viewers who saw it that summer of 67, as all things Bardot soon entranced him. Anna probably became a fading memory fairly quickly for those involved but it remains a captivating experience, and one that seems specific to the sixties, as something this alive and colorful would have been all but impossible at any other point in time.